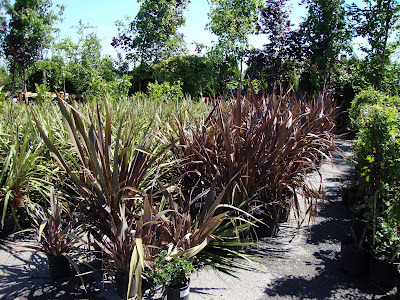 My birthday isn’t actually for two weeks, but since we’ll be busy then we took advantage of the long 4th of July weekend to make the annual birthday trip to Cistus Nursery. Andrew started the tradition with a Cistus Gift Certificate my first birthday after we moved to Portland, but since then has forgone the formality of paper and just takes me shopping. 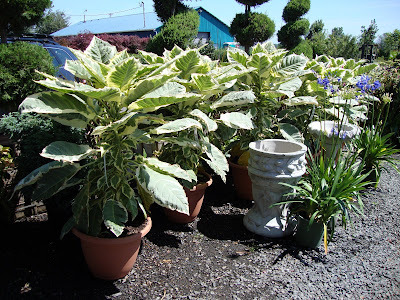 This year we expanded the trip since we’ve never been to Means Nursery and the Nestmaker has been singing it’s praises as the go-to place for a bargain. Means is just a little further down the highway from the Sauvie Island Bridge (Cistus is on an island, Sauvie Island) and coincidentally right across the street from where you turn to go to Joy Creek Nursery, we could have made it a triple run but I didn’t want to get to carried away. This was the first bargain to smack me in the face… these are only $29.99!!! Never mind that they are only marginally hardy here I was trying to figure out how we were going to fit a couple in my husband’s car (a Scion XA…small, very small). 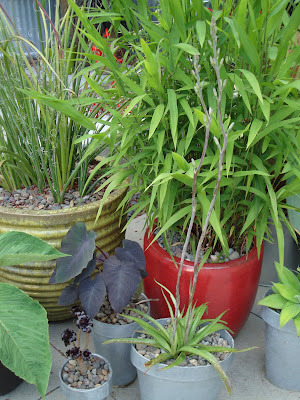 Then there were the Flax, only $12.88 for a 5 gallon pot and plants that were about 4ft tall! A great deal. 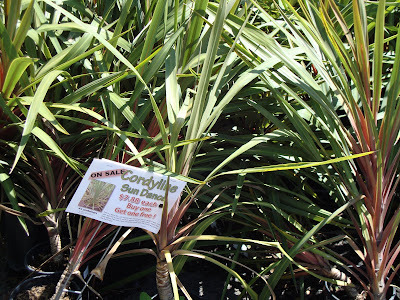 Cordylines for $7.88, buy one get one free! 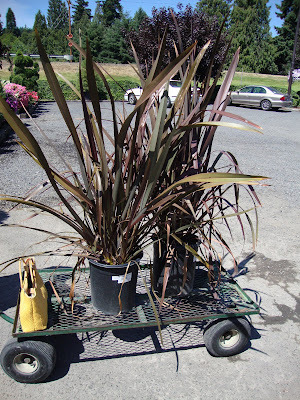 I managed to leave with just 2 of the Flax, the price was excellent and a couple would work nicely at the back of the shade pavilion to help distract your eye from the view through the fence of the neighbor’s backyard. On to Cistus. I was just there a month ago but every time I see new things. This charmer was growing by the parking lot, in front of the screen blocking out the Porta-Pottys. I meant to ask what it was but forgot until I downloaded the pictures and saw it again. Darn. Andrew wanted to take this one home, but it wasn't for sale. We found out it’s a relative of the Dandelion and grows in the Canary Islands. Love the stripes on this Agave. 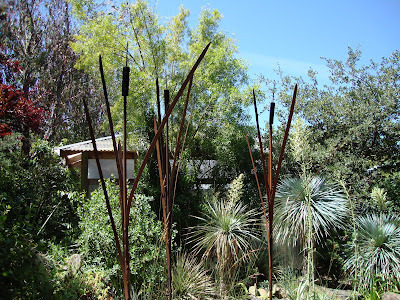 The rusted cattails are really propane torches, love them! Great garden lighting. Ok…I finally made my mind up and was so excited about my “gifts” that I forgot to take a picture of them at the nursery! 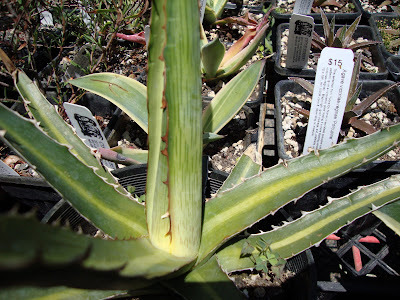 I had to have this Agave Americana ‘Mediopicta Alba’ – love that the stripes are reverse of my other Americana (yellow on the sides and blue/green in the center) and more of a creamy white than yellow. The way it tilts a little makes me think of Lotusland. I have no idea why, having never been there, but maybe I saw a picture with tilting agave? Bonus! 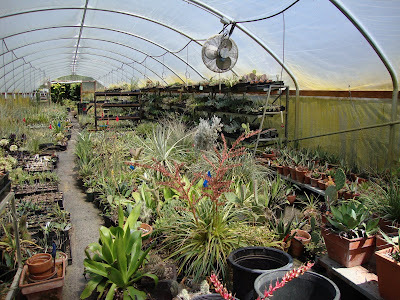 When I potted the Agave (somehow managing to not damage a single leaf!) I discovered this little pup under one of the leaves. It’s about the same size as the ones they were selling for $22, I’ll think of it as a free gift with purchase! 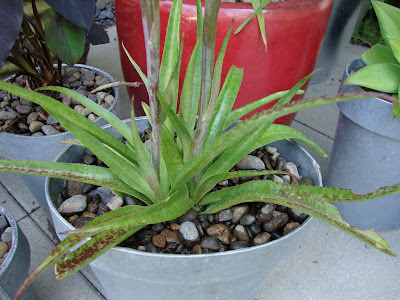 My other must have was this little Manfreda maculosa, or Rattlesnake Agave. 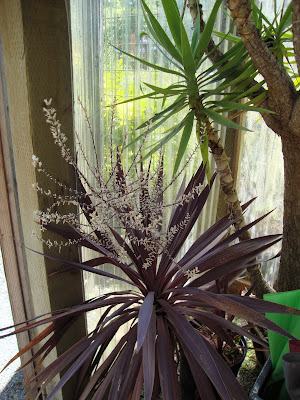 Its leaves are so fleshy and soft, not at all like you would expect from an Agave. It develops more spots when it’s exposed to the sun and has these 2 tall bloom spikes about to bust open. According to the tag it’s hardy to zone 7 so I could have put it in the ground, but the tag also warned to keep it away from ambitious slugs. The blooms are supposed to be greenish pink and smell divine. These new additions have me wondering, when does one cross the line and officially become an agave collector? Don’t you just love birthdays?! You have already crossed that line, with an enviable collection I might add. I <3 that mediopicta alba. Some day you'll have to demonstrate your technique to avoid breaking leaves. My plants always look abused after I repot them. That's a wonderful birthday tradition. I'd suggest such a birthday idea to Justin if it didn't make him sad to go places where there is dirt. It's also handy your birthday is in prime gardening months. 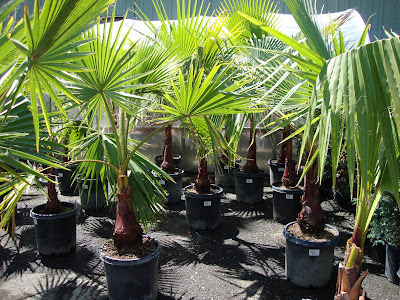 Only the diehards like to go plant shopping for my December birthday, although I can usually con my mom into it, but she doesn't think it's fun. Isn't Mean's fantastic for a bargain? I couldn't get by only shopping there, but it's a good place to start before you spend money somewhere else. I think you can legitimately call yourself an agave collector. I want to go to Cistus. And Means. And running over to Joy Creek--even if just to stand in their bamboo grove--wouldn't be bad either. Megan, I am embarrassed to admit how long it took me to figure out what you were saying with the <3 ... but I finally got it! 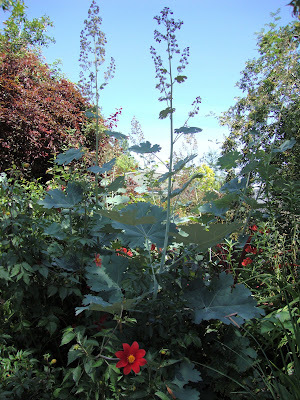 I'll happily demonstrate my planting technique, but be warned that in leau of the plant being damaged I usually am. Someone/thing has to be harmed in the name of agave beauty. It must be true love for you to be with someone who is upset by dirt! Patricia, thanks for the b-day wishes! Ok...I'm game, let's go shopping! Who's driving? Happy birthday in advance, and it looks like you have some beautiful birthday presents already. 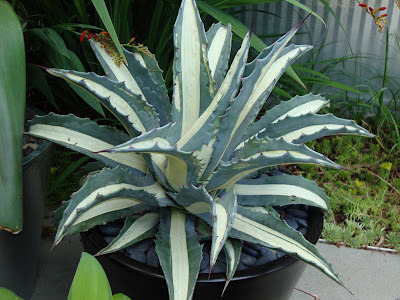 I love that variegated agave especially. 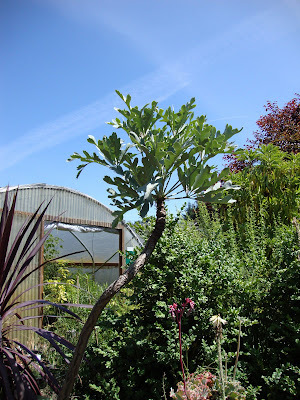 I grew the manfreda in my old garden, and it was very reliable in a pot for many years and then in the ground for a while. 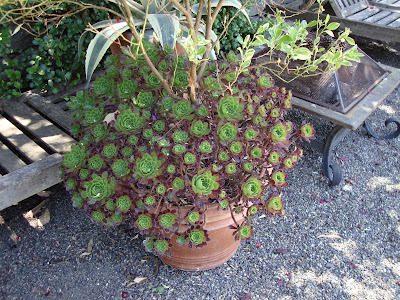 I eventually transplanted back into a stock-tank planter because it kind of got lost on the ground. I don't remember whether the bloom smelled good, but it was pretty. 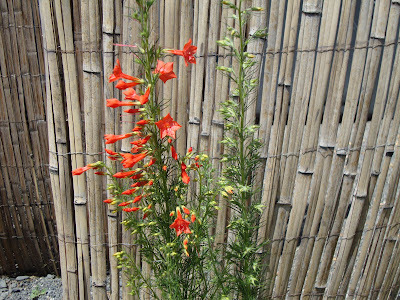 Hummingbirds ADORE this plant. I've had them bloom first year from seed up in Michigan. Thanks Pam, so do you still have the manfreda, or did it stay behind in your old garden? Jenn, thanks for the ID! We already have several hummingbird magnet plants but always looking to have another. I would certainly love a birthday like yours! It stayed behind, but I may go back and get it. Since we haven't been able to sell the house, I still have the prerogative of picking over the garden.